The recessionary years in Tucson’s office market are best characterized by uncertainty and stagnation. As the sprouts of recovery begin to emerge, a sense of stability is present for the first time since 2008. That being said, it is a tentative recovery, far from robust. Medical uses represent the strongest demand in the market and will remain a primary growth industry for the region. New practitioners, primarily specialists, are entering the Southern Arizona healthcare scene, and urgent care demand is high both due to the economy and their efficient delivery of service. While opportunities in construction and related professional services are limited, we have seen mortgage brokers positioning for an eventual comeback on the residential lending front. Market wide vacancy ended the first quarter flat to slightly improving, ticking down to 11.7% from 11.8% at year end. With continued competitive pressures on rents in a market where tenants remain a hot commodity, asking rates declined another 2.1% over the previous quarter; however, we believe effective rents have stabilized. Office-using demand is specialized, and generally soft. Traditional office space users, such as law, accounting and financial services, have not returned to the market. Flex and back office occupiers of industrial space have moved up to avail themselves of higher quality space at competitive rates, and call center activity has returned to the region, with an 81,835 square foot (sf) pharmacy benefits support center announced at the UA Tech Park in the southeast sector. Charter school activity remains relatively high, yet most market activity is not representative of economic growth; rather, of renewal activity, moves and consolidations. With continued economic headwinds, sales are occurring at a very modest increase over 2011’s pace and are largely a product of proper pricing. Both investors and users are price sensitive, and almost no traditional investment grade property is on the market on a cap rate basis. Commercial lending remains tight, and while financing is available, strong credit is a must. We do note a small number of land transactions in escrow for medical users in the two to eight acre range. 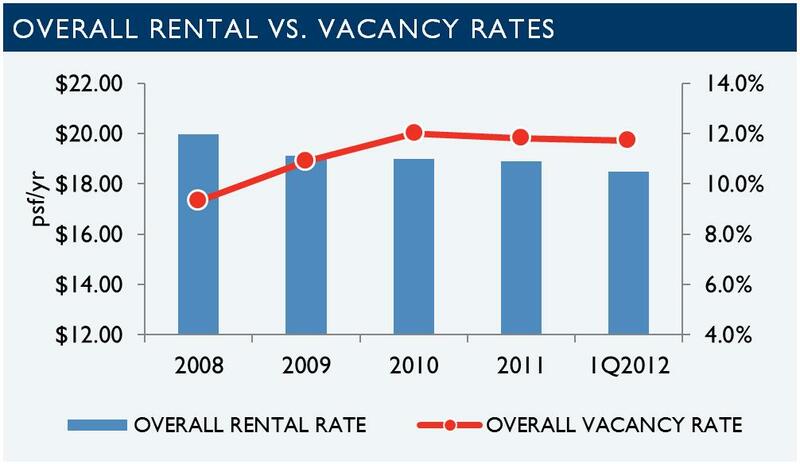 Fundamentals to a recovery in the Tucson office market are slowly improving. With appropriate and responsive pricing, some properties, both for lease and for sale, are positioned to benefit from the modestly increasing pace of interest in the market. Medical buildings in particular should experience positive activity and momentum. Reflective of pressures on government spending at all levels and defense cutbacks, support services and office users in the region will ultimately be impacted, given the importance of aerospace and defense jobs in Tucson’s private sector. Of significance, the construction of Tucson’s Modern Streetcar, “Sunlink,” is underway for a late 2013 delivery, and if overlay zones are approved, the downtown and University/Main Gate areas will benefit. Click here to download a printable copy of this 1Q 2012 MarketBeat Report.